No, this isn’t the “Shallow” performance, but this was a better song anyway. Photo: Neal Preston/Warner Bros.
Because apparently the Oscars need to be even shorter, only two of the five Academy Award–nominated original songs will be performed live during the telecast. Per Variety, multiple sources say that Kendrick Lamar and SZA’s Black Panther song “All the Stars” and Lady Gaga and Bradley Cooper’s Star Is Born song “Shallow” will be performed live during the Oscars broadcast on February 24. The other three songs — “The Place Where Lost Things Go” from Mary Poppins Returns, “I’ll Fight” from RBG, and “When a Cowboy Trades His Spurs for Wings” from The Ballad of Buster Scruggs — won’t get the distinction of being performed live, but they will be named as nominees, because it’s the least the Oscars could do, really. (Good news for Cooper, who revealed in November that he already has an idea for how he wants their performance to go: “There might be a cool, unorthodox way we could perform it,” he teased to Variety.) It’s unknown how songs selected for the telecast were chosen. The Academy told Variety that no decision on song performances has been made yet. 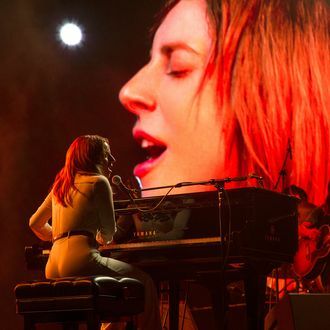 Meanwhile news of the abbreviated performance slate is reportedly “already causing consternation among members of the music branch as well as among those nominees’ respective camps.” (An added headache: “All the Stars” and “Shallow” are from the same label, Interscope.) According to Variety, all of the nominated songs have been performed in six of the past ten Oscar telecasts. Why did you do that, do that, do that, do that, do that to me!